Capturing human-machine interaction can be a challenging task. Multiple forms of data can be collected, from user actions on the computer and eye movements to physiological and simulator data. Performing Human Factors research requires a well-equipped, user-centered lab and specialized knowledge. We can help you at every stage of your research process, from the set-up of your lab to the interpretation of the results. Realistic simulations under controlled conditions. Superior video recordings and screen captures. Fully integrated equipment and software. Our state-of-the-art Experience Lab in Wageningen, The Netherlands, is equipped for a wide range of studies in psychology, consumer behavior, usabi-lity testing, HCI research, and Human Factors. It is designed for observations in an office, meeting room, or living room setting. The lab has several rooms with set-ups that can be converted depending on your needs, allowing it to be used in a wide range of applications and for the evaluation of a variety of services. The participant or user room is equipped with a computer, phone, desk, and chairs and is perfect for testing the usability of hardware, software, websites, and documentation. It can easily be modified to create a setting for observing other phenomena such as interviews, focus group sessions, or parent-child interaction. High-quality recording of the sessions is guaranteed by professional audio and video equipment, including ceiling mounted dome cameras. All cameras can be controlled remotely from the observation room so you can zoom in on a topic of interest. Select different recording methods: split screen, Picture-in-Picture, Picture-by-Picture, or multiple videos. Study data from multiple sources including physiological data, eye tracking data, facial expressions, etc. All cables and accessories are included. 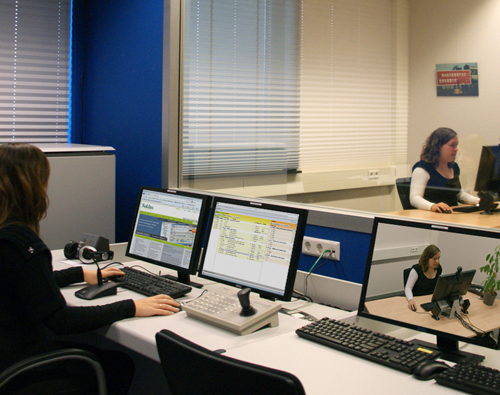 Behind a one-way mirror, up to six observers can comfortably watch a session, both live as well as on computer and video monitors. The test leader can communicate with the test participant(s) via microphones and speakers. Loggers have access to The Observer XT, the professional software for the collection, analysis, and presentation of observational data. With The Observer XT you can also create highlight clips for presenting results to clients and colleagues. In the spacious conference room, ideal for studying larger groups, you will find all video equipment necessary to observe and record meetings with up to 24 participants. Alternatively, this room can be used if a larger number of people wish to observe sessions in the standard participant room. Other peripherals such as additional microphones, special cameras, or programmable keyboards are available upon request. DVDs for archiving your video images are included. Most common video formats are supported. All participant and observation rooms have direct internet access via our Gigabit network. Beverages are provided free of charge and additional catering is available upon request. Wageningen is located in the center of The Netherlands. Ample free parking is available. The lab is also served by public transport.